Beautiful spacious apartment. Very comfortable bed and great bathroom. Location excellent and friendly efficient reception staff.. Would definitely recommend it to other friends and colleagues. The location was excellent, right across the street from Liverpool Street station and close to a number of restaurants, cafes and supermarkets. The layout of the flat was pleasant and the kitchen was well fitted. Excellent location, great space and amenities, comfortable and quiet. This small apartment was outstanding. Across the street from the Liverpool station - we took the tube to the property and an Uber and the Heathrow express back to LHR. he staff was OK. Bed was a queen - a little odd because it had rails at the head and one side, so my husband had to crawl in from the end rather than get in on "his" side. Nice kitchen, and a washer dryer combo. toaster and fridge. It would be great for a business person who needed to spend the week in town. Nice amenities, but no real shampoo. Still, coffee and tea daily with kettle - all services daily except Sunday. The location was near to a main train station (Liverpool). The staff were friendly. Bed was comfy, decor modern and location was excellent. Good sized rooms, cozy interior, great location (with a view of the Gherkin from the window). Lock in a great price for 196 Bishopsgate – rated 8.5 by recent guests! 196 Bishopsgate This rating is a reflection of how the property compares to the industry standard when it comes to price, facilities and services available. It's based on a self-evaluation by the property. Use this rating to help choose your stay! Located in the heart of London's financial district, 196 Bishopsgate offer fully serviced and modern 4-star hotel apartments, across from Liverpool Street train and subway stations. 196 Bishopsgate have a range of accommodations, from Studio to Executive Apartments. 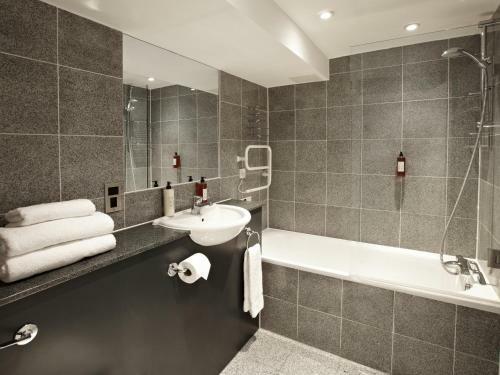 All stylish apartments have free Wi-Fi, contemporary decor and a luxurious marble-clad private bathroom. Each apartment offers a separate living space, dining area and a fully equipped kitchen with dishwasher, fridge and microwave. Features also include a plasma-screen TV, DVD player and CD player. London’s South Bank, home to the Tate Modern, National Theater and London Eye, is just a few stops away on the Tube (subway). When would you like to stay at 196 Bishopsgate? This apartment features free WiFi, a fully fitted kitchen and an private bathroom. Spacious open-plan studio apartment with double bed, fully equipped kitchen, a plasma-screen TV and marble private bathroom. Spacious apartment with a double bedroom, a marble-clad private bathroom and a separate living room with a kitchen and plasma-screen TV. Spacious apartment with 2 double bedrooms, a marble private bathroom, a fully equipped kitchen and a living room containing sofas, a plasma-screen TV and a stereo. House Rules 196 Bishopsgate takes special requests – add in the next step! All children under 6 years are charged GBP 55 per night for extra beds. Any additional older children or adults are charged GBP 55 per night for extra beds. 196 Bishopsgate accepts these cards and reserves the right to temporarily hold an amount prior to arrival. Please inform 196 Bishopsgate of your expected arrival time in advance. You can use the Special Requests box when booking, or contact the property directly using the contact details in your confirmation. noisy air con outside all through the night, and bed was very uncomfortable. Very noisy outside, more than just usual London traffic. if you're looking for an early nights sleep, don't stay here. Location, size, ease of access. The bathroom is a little small, but no problem . Superb apartment. Very well decorated and furnished, simple and unfussy. No lift direct to floor. Serious noise issues overnight resulted in nobody in our party getting any sleep. The price midweek was a little high, other accommodation in the area was slightly lower but sold out. 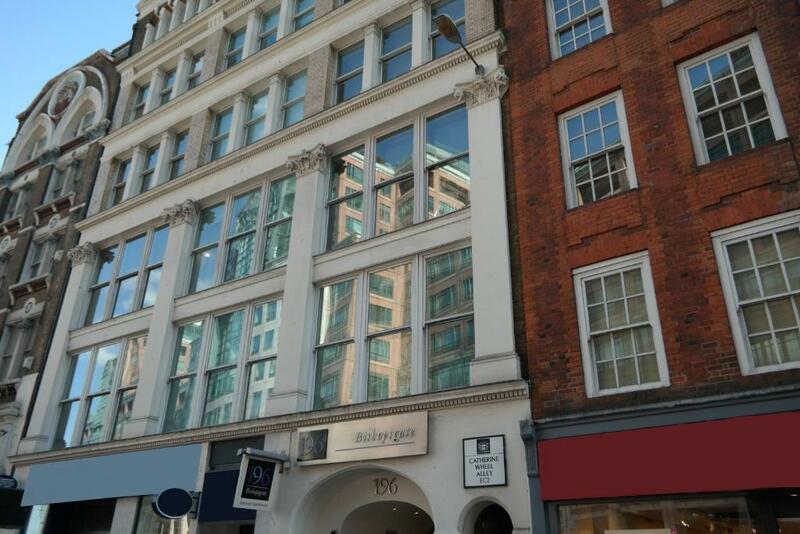 Great central location, across the road from Liverpool Street Station. Close to bars and restaurants.